The Audit Committee serves as the link between the auditor, the board and management. Members coordinate and monitor the process of the audit and oversee the organization internal controls and risk-management procedures. The Development Committee is responsible for implementing the fundraising and development strategies of the organization. Responsibilities include preparing the annual development plan and budget and implementing the plan in identifying, cultivating, soliciting, and stewarding donors. The committee is also responsible for soliciting annual Board giving. The Child Committee meeting to select and place applicants in preschools for the 2018 -2019 school year. The Finance Committee oversees the management of the organization's finances, creates the annual budget, and establishes and reviews investment policies and strategies. The Governance Committee manages all processes related to the identification, recruitment, and stewardship of board members. The Marketing Committee oversees the implementation of the organization's communications plan. Areas of responsibility include the website, social media, newsletters and press and public releases. The committee is responsible for the design and production of all marketing materials. The Child Committee manages the family application process. Members review and rate applications for tuition, interview applicant families, select families to receive tuition and place students in appropriate partnership schools. They also plan the annual orientation for the families of accepted students and conduct periodic alumni tracking to collect qualitative data on alumni progress. 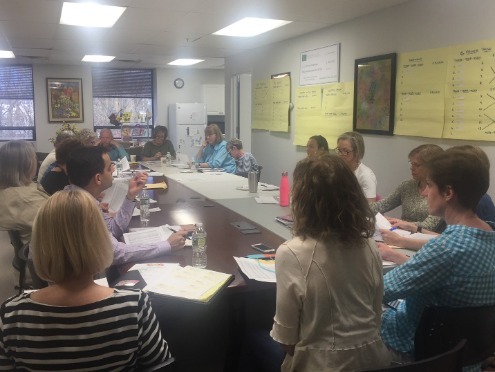 The School Committee actively manages relationships with each of our partner preschools. Members visit schools on a three year cycle to ensure quality is maintained. We support the work of the marketing committee in promoting the organization with partner preschools and in the preschool community. The committee also looks for new schools on expansion in target areas as defined by the organization's strategic plan. Plans and runs the Golf Outing held in June each year. Plans and runs the annual benefit held in October each year.